Trauma affects all levels of society, including the home, school, religious institutions, social service organizations, public and private business, the arts and all areas of culture. A major movement has been occurring, throughout the nation, to change our perspective on trauma-informed approaches. The goal of this movement is to increase sensitivity in client care and prevent re-traumatization. 1. Realizing the widespread impact of trauma and understand the potential paths of recovery. 2. Recognize the signs and symptoms of trauma in clients, families, staff, and others involved in the system. 3. Respond by fully integrating knowledge about trauma into policies, procedures, and practices. 4. and seeks actively to Resist Re-traumatization. This guidance has resulted in paradoxical shifts that promote Resiliency and Regulation to promote positive Recovery. These “R’s” are essential to the practice of social work and mental health. As the ideas and practices spread through society, we have to explore lesser recognized R’s of trauma-informed care, including Respect and Relationship. These two R’s are elements of success in creating a trauma-informed (cultural of) care. Respect starts with the individual – has to start with the individual – and then slowly moves through-out society. It starts with the parent in the home, the social worker in the field, the rabbi in the synagogue, the teacher in the physical education program, the supervisor in the organization. This light sparks from respecting oneself and then it then gets paid forward to others around them. It brings gratitude for beauty in the person and harmony in the “house”. It sustains families and transforms organizations and the world. Respect is defined as the admiration of someone’s ability, qualities or achievements. It creates an atmosphere that promotes safety for the trauma survivor. The question most often asked is how to put these “R’s” into daily practice? How do you make them a Reality? Recruiting, hiring, and retaining trauma-informed staff. Training behavioral health service providers on the principles of, and evidence-based and emerging best practices relevant to, TIC. Developing and promoting a set of counselor competencies specific to TIC. Delineating the responsibilities of counselors and addressing ethical considerations specifically relevant to promoting TIC. Committing to prevention and treatment of secondary trauma of behavioral health professionals within the organization. A lack of safety often looks like mistrust, a common problem for survivors. Trauma impacts the whole person. I manifest in our physical, mental, emotional, and spiritual self. Symptoms of trauma often come with emotional numbness and a desire to isolate from others. It results in a lack of interest in social connections and impairs parenting, marriages, and working relationships. It can also impair clients and patients desire to seek the services they need because they don’t feel safe. All of this must be held in the context of a Relationship. The relationship is the healing factor behind it all. Without relationship, there is no family, no organization, no church, no society. In the science of resiliency, the relationship is how we tip the scale from negative to positive outcomes. One healing relationship in a chaos of trauma can provide enough emotional strength for a child or adult to survive. 1. 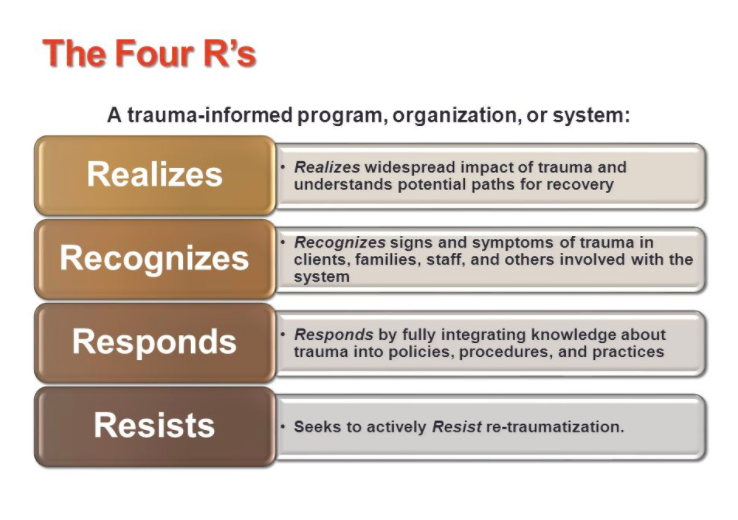 How has your organization utilized the 4 R’s of Recognize, Realize, Respond, and Resist Retraumatization? 2. What can you do to start or improve on any efforts already done using these 4 R’s? 3. Can you define the concepts of Regulation, Resiliency, and Recovery? Write these definitions on an index card and consider them each time you interact with a co-worker, friend, or client. 4. How have the ideas of Respect and Relationship impacted you personally and/or how have you used these two powerful R’s to move others to more positive outcomes? ~> Need training or consultation on how to implement Trauma-Informed Care into your church, school, or business? Let Ron Huxley help you train your staff or community. Email him today at rehuxley@gmail.com or call 805-709-2023.